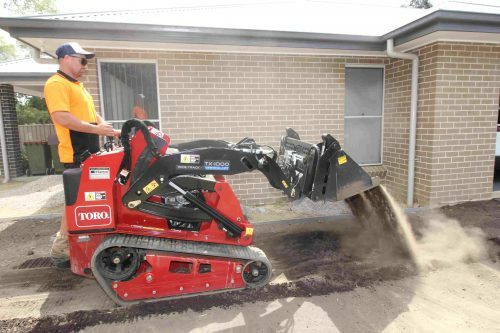 JRA provides a full range of landscaping and mowing services to residential and commercial customers between Penrith and Katoomba in the Blue Mountains district. “When we started the business all the work was done manually and some days it got pretty tough”, Jamie recalls. “It didn’t take us long to realise the key to a successful landscaping business was having the right tools and equipment to complete jobs in the shortest time possible. We started hiring equipment, and this was a great way to find out what equipment worked best for us. “Hiring our major equipment let us look at the range, features and quality of landscaping gear, the range of which has expanded, with designs improving dramatically over the years. Productivity was always our goal and we looked at all types of equipment in terms of performance, value and return on investment. “The Blue Mountains district has its own set of challenges. It’s an area that can receive a high rainfall and there are often steep, slippery gradients of tight access that need to be managed. “We checked out many different brands and machine configurations, but at the end of the day we decided on a Toro TX 1000 stand-on track loader that promised all the features, benefits and value that we were seeking. It was great to discover that we made the right choice: the Toro machine did everything we were asking for and more. It’s certainly unbeatable and an ideal solution for our business. “It was a bonus to find that the Toro machine performed almost to the point of some of the low-end sit-in machines. However, as opposed to a sit-in machine, the Toro allows us to rapidly jump on and off many times during each task cycle. “One of the first things and operator notices about the TX 1000 is its incredible stability. At no stage do you ever feel you’re in danger of tipping or losing control of the work. “Another advantage of the Toro machine is its high bucket reach which works extremely well when unloading trucks or lifting turf, posts, cement bags and other supplies to where they are needed. While many other brands have wheels, the Toro TX 1000 has very efficient tracks that that provide extremely positive traction while letting us move around quickly without making any adverse impact on the surface, even in wet conditions. “The sheer grunt and power of the Toro TX 1000 continues to surprise us. At no time does the machine ever feel stressed or labours, regardless of the load we ask it to carry or the constrained spaces into which we often need to manoeuvre it. On top of this power, it has amazing speed and rapid response controls that enable us to fill and unload the bucket quickly to move soil and turf very efficiently. Nothing seems to stop this machine. It just keeps going day after day, willingly doing everything it is ever asked. “Because we drive our equipment hard, we tend to observe shorter service intervals than those recommended. Once a machine reaches 1,500 hours, we like to trade it in on a new piece of gear, because we have found it really pays to have top equipment in peak condition all time, simply because of the productivity this approach delivers for us. “A well-designed and well-engineered piece of equipment like the Toro also has the benefit of being very intuitive and simple to use, even for novice operators. We find that even putting an apprentice or a novice operator on the machine, they can become proficient and master the controls very quickly and feel right at home on the machine from the very first minutes. “We are always busy and don’t have time to waste doing our own servicing. Over time we have found it more efficient to let the distributor, Semco do that for us and have found this works well. They often do the servicing on site or on occasions we put the TX 1000 on its trailer and take it down to their service depot. “These machines pay for themselves in the first twelve months! You don’t get a better return on your money than that. The Toro is built for tough work and that’s exactly what we give them, day in day out. Whether it’s cleaning our job sites, preparation of the surfaces, getting ready for laying turf, the Toro TX 1000 just rips through the day!”, said Jamie.